Before talking about safe cleaning up WinSXS Folder in Windows server 2012 let’s try to understand what is WinSXS folder, what is saved in this folder, and why its size is constantly increasing in course of time. If you remember during installation of additional features in Windows Server 2003 the installation wizard demanded to put installation disk in CD-Rom or to show the way to the catalogue with Windows Server 2003 installation package. Microsoft decided to change its policy for Windows additional roles and feautures in Windows Server 2008. Now all binary files which are necessary for any role roll-out are stored in folder %windir%\WinSxS (WinSxS – Windows Side By Side). 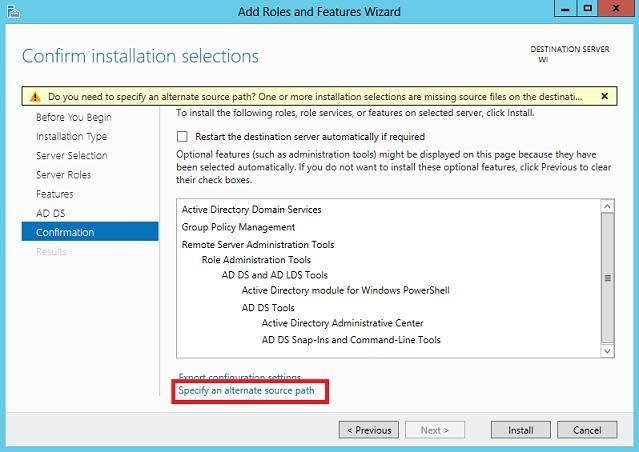 This means that in case of any additional role installation there is no need to search and connect the disk with installation package to the server. Of course in case of such attitude much more space is needed for OS. It is necessary to understand that system key components are located in WinSXS catalogue and it is not allowed to delete anything from it manually by no means. Why is it constantly increasing in size? The answer is simple – updates. During installation of updates for different features in WinSXS catalogue the old and the new version of the updated feature is saved. Due to such architecture we can safely delete any installed update at any time and return to the old version of the feature. Tip. Windows 7 SP 1 can decrease WinSxS folder size by deleting unused updates. And what should one do if the system is launched and works well, there is no need in additional roles rollout but it is still not enough space on disk? It seems quite illogical that several gigabytes on system disk are taken for installation packages which will never be needed! Unfortunately, it’s rather difficult to delete these files without any system damage in Windows Server 2008. However Microsoft in the new server OS (Windows Server 2012) decided to improve this disadvantage by implementation of a new function which is called Features on Demand. Features on Demand function allows to decrease space on disk which is taken for system files due to possibility of unused roles binary files deletion from WinSxS folder. In case when later on there will be a necessity to return a previously deleted role all necessary files can be found in Windows Server 2012 installation package image, Windows Update service or network resource with the original content. Available: the role is not installed on the server, however all necessary files are available on disk, which allow to install/ activate this role at any moment. Correspondingly, in case of any role installation via GUI or Powershell (Install-WindowsFeature command) its state will be changed from Available to Installed or in case of deletion(Uninstall-WindowsFeature command) and vice versa . 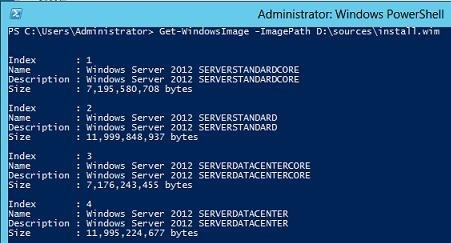 Role deletion from disk (from WinSxS folder) is possible only via Powershell. Special command argument Uninstall-WindowsFeature –Remove should be used for this purpose. 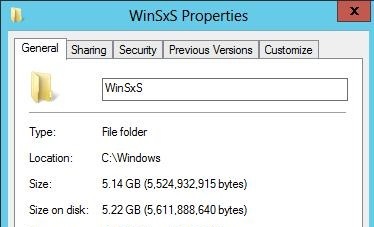 In our example, providing that only one file-server role was installed, the size of WinSxS folder will decrease from 8 to 5 Gb. It is not a bad result, isn`t it? Even more so, we used only one command for WinSxS folder cleaning up. One more example, let’s assume that you need to install some Windows Server 2012 role, but it`s installation package is deleted from WinSxS catalogue. It is possible to recover this role in several ways: with a help of GUI Server Manager or with a help of Powershell. Please find the version of Windows Server which is installed on your PC and remember its index ( the value in the Index line) In our example it’s Windows Server 2012 Datacenter with index 4. Open the Server Manager console and enable the role installation Manager (Add Roles and Features). Select role or feature which is needed to be installed. 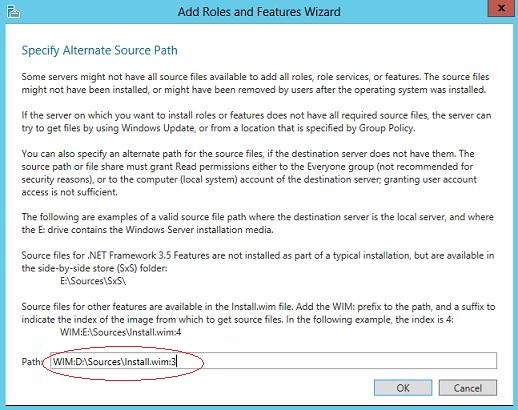 The Manager will warn you that some files which are needed for this role installation are missing and you have to specify an alternate source path to installation package location. Press Specify an alternate source path button. After the OK button is pressed all files necessary for the installable role will be copied to WinSxS catalogue. If it is needed the path to the catalogue with WIM file or network path to the WinSxS catalogue may be specified in this line. Besides, it is possible to specify the path to this catalogue for the group of servers with a help of group policy ( Computer Configuration / Administrative Templates / System / Specify settings for optional component installation and component repair). 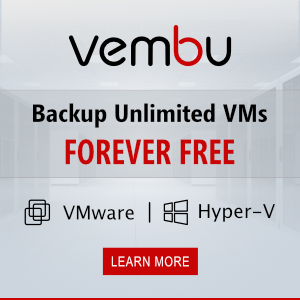 The last variant is very convenient if it is needed to perform plenty of server installations with Windows Server 2012 because the total effect of such cleaning may lead up to hundreds gigabytes. 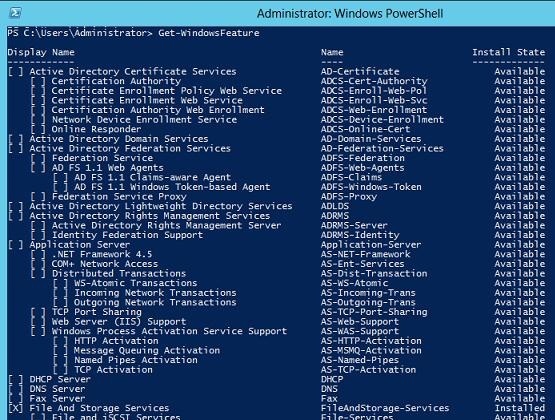 So in this article we learned with a new Windows Server 2012 function which is called Features on Demand it allows to delete binary files with server roles installation packages from WinSxS catalogue. 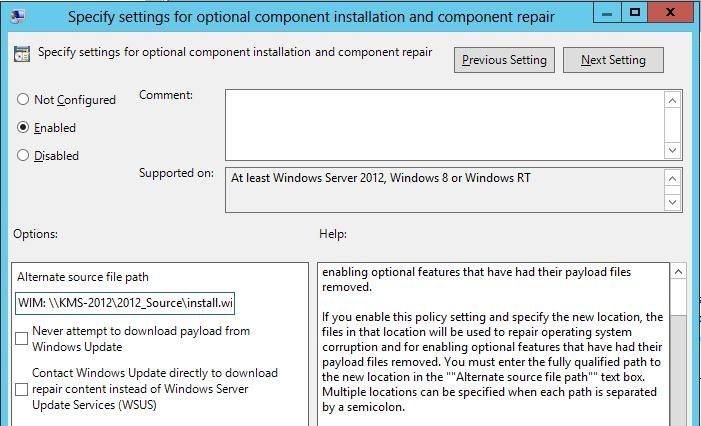 The deleted role can be recovered if it is needed: all you need is Windows Server 2012 installation package. Feature on Demand in Windows 8 works a little bit differently, this is because Powershell command let which we have used in previous cases simply doesn`t exist here. DISM command with /Disable-Feature parameter is considered to be its analogue (not so convenient).WinSxS directory contents can also be compressed more about this in the article: How to Clean Up and Compress WinSxS Folder.